Advantages of Diabetic Socks Diabetic socks are different than ordinary socks in a few very important ways. Diabetic socks can help save your feet from serious complications. Diabetic socks have a multitude of benefits for anyone, but especially a diabetic. Diabetic socks are also great for anyone with arthritis, edema, neuropathy, or poor circulation. Diabetic socks offer superior comfort and are designed to keep feet cool and dry. They will also reduce leg fatigue and aches, as well as prevent circulation problems. Diabetic socks are designed to protect the feet and lower legs. One of the many great things about diabetic socks is that they are designed with smooth seam construction so there's no bulky seam to irritate and cause friction on the toes. They feature a "gentle" graduated leg upper to prevent the sock from digging into the ankle/calf and restricting circulation, so NO SOCK LINES! They include a ventilated air flow mesh on top of the forefoot and instep, and a Nano Bamboo Charcoal Fiber padding in the heel and bottom of forefoot for added comfort.The bamboo/charcoal also wicks away moisture from the feet to keep them cool and dry. Diabetic socks include a light arch support which gently hugs your arch to keep your feet feeling supported. 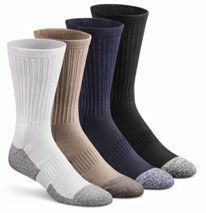 Diabetic socks are offered in all sizes and several colors. They are even available in extra roomy sizes for those who need a little more space than others. Diabetic socks have a "Y" heel to toe construction which means the socks will not bunch up around the toes or under the heel. Lastly, Diabetic socks are also antimicrobial so they kill 99.9% of all bacteria. The benefits of a diabetic sock from Family Foot & Ankle Specialists are unsurpassed by any other sock that can purchased in a retail store. Ask about getting your very own pair of diabetic socks today!